Um espaçoso, ensolarado vista para o mar casa, de frente para o canal. Localizado em um bairro tranquilo (com o mar de um lado e árvores e parque da cidade do outro) nossa propriedade tem vista para a entrada do canal e ilhas próximas, e Pearson Cove. 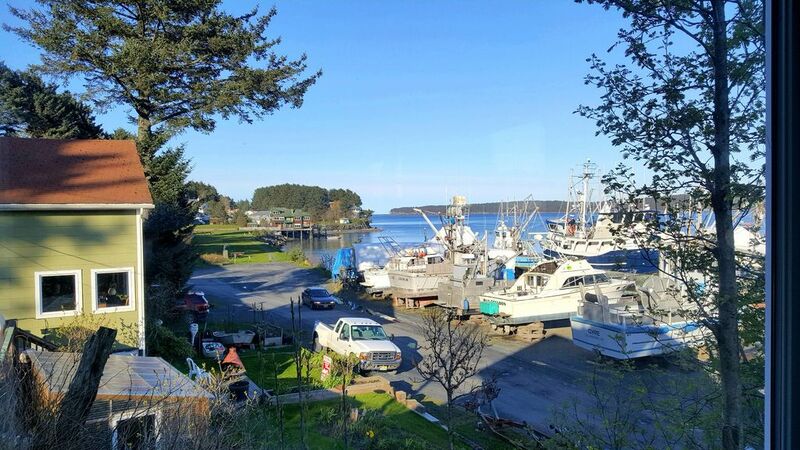 O Kodiak Boatyard fica do outro lado da rua e é tipicamente movimentado em maio e setembro, quando ocorre a pesca comercial, geralmente tranquila no verão. Recentemente, expandimos os nossos serviços como uma casa totalmente mobilada de mês para mês locações para profissionais, gerentes de projeto, ou necessidades de curto prazo para os povos, disponível entre setembro e maio. Por favor, pergunte para a taxa especial. Área inicial é de 1600 sq. Pés. Acordar com uma xícara de café ou chá, enquanto admira as muitas janelas de frente para o oceano é um prazer. Apenas alguns minutos a pé do centro de Kodiak, a casa enfrenta o sul, com vistas espectaculares sobre o oceano e nas proximidades Woody ilha e perto do console. Relaxar e assistir a vida selvagem abundante de Kodiak: muitas águias, leões-marinhos, lontras marinhas e leões marinhos. Localização da nossa casa é o ponto de vista perfeito para assistir os muitos barcos de pesca e de recreio comerciais indo e vindo. Nós fornecemos um livreto para ajudar a identificar os muitos navios diferentes. A principal sala de estar e mesa de jantar estão nesta área. Através das portas francesas, são um quarto novíssimo banheiro / lavanderia e quarto e uma pequena área de estar com a biblioteca de televisão e dvd. O segundo andar tem um quarto grande com vista espetacular canal, uma grande casa de banho, e uma pequena área para um futon extra, ou cama inflável. (Há muito espaço para mais de duas camas adicionais, especialmente para dormir casual para crianças). Banheiro do térreo inclui novíssima máquina de lavar e secar roupa, toalhas, roupas de cama. Duche e banheira também. home! House was in the perfect setting for our quiet little trip right next to the museums and great restaurants. The owners was wonderful with booking. Everything about the house was as represented. We thouroughly enjoyed our stay. Lacey is a great hostess, eager to meet all our needs. The house is spacious and has a "true Kodiak" feel. It overlooks a ship yard. My kids were fascinated to watch the work being done on the boats. We could see otters and sea lions in the water from the dining table. The home was quiet and well maintained. This was a perfect place to stay and we will definitely plan to stay again. So glad we were able to have your family stay this spring. Am especially happy that your daughter was able to experience some marine science agency experience while there. We welcome you back anytime and thanks again! After reading a somewhat negative review of this property, I feel compelled to give my opinion of it. I am today finishing an eight night stay with my brother in law and his son. All three of us have had a great time here. The home was indeed clean and very well furnished. The beds were all equipped with very comfortable mattresses. Owning a 50 room motel myself, I realize that not everyone will be happy with mattresses. Too hard, too soft, etc etc. The view from the home is really quite nice. In the morning you have a great sunrise. The boat yard out of our main windows is not really unattractive. We did see repair work being done but I couldn't hear any noise from the house, especially with the windows closed. For the most part, it was more of a boat storage area and not a boat repair shop. For the parking, I believe the website mentions that you have to climb steps to get to the unit. This isn't true at all. The road into the home ends right at the house. You can park at the assigned spot, immediately beside the entrance. Very convenient. We did have a bit of trouble reaching the owner , Lacey. I missed her information that she was commercially fishing on the other side of Kodiak Island and her cell phone didn't work. She did respond to my emails promply however. If there was a need for any help, she did give the phone number of her "helper". We finally met Lacey and found her to be charming. She even gifted us with some fish from her freezer when she found out our Salmon fishing was slow. This was above and beyond the call of duty! You could walk to the downtown area but I personally wouldn't . It's maybe 3/4ths of a mile there, and at 70, I prefer to drive. We will hopefully return, God willing. Thank you, Bill! It was such a pleasure meeting and talking about our vrbos, and you gave me some excellent pointers! You were all so pleasant and hope you enjoyed the trip, but you were not catching too many-I felt compelled to give you some fresh kings! I know you'll enjoy those on a BBQ. Please come back anytime--you enjoyed some of the hottest weather in September ever! Its 80 degrees today. Also thanks for the note on the counter. Hope to see you again, either in the Keys or here in Kodiak! Wonderful time fishing, cooking and living! We had wonderful time. Caught lots of fish and enjoyed cooking and eating them. Our experience was just as what we had hoped. We would like to express our appreciation for Lacey's kind concern and letting us stay at her beautiful house. Convenient, will equipped , accessible, comfortable. Accessible, clean, very well-equipped, wonderful beds and mattresses, plenty of extra towels and blankets, great kitchen. Mudroom is a real plus in a place like Kodiak. The only thing I would comment on is the new white rug. While we were careful to take off our shoes every time we came in the house, it is going to be a challenge to keep it clean. We would definitely stay here again.